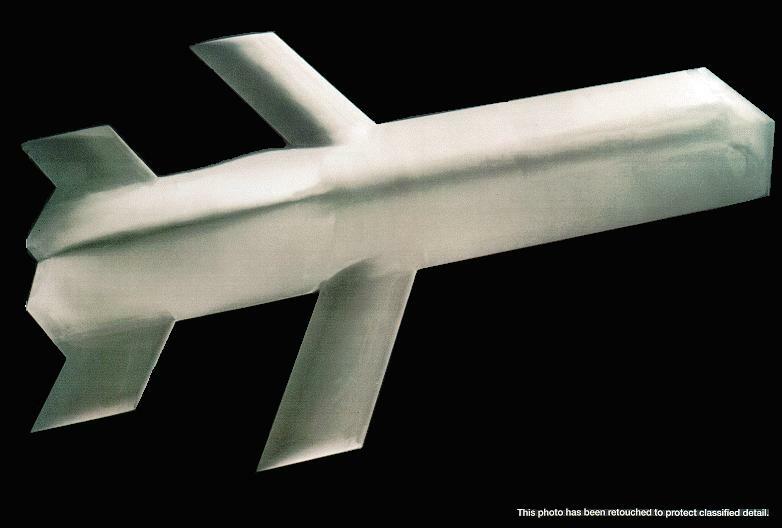 In 1986, the Air Force began developing TSSAM to provide a low observable conventional cruise missile. Key characteristics included long-range, autonomous guidance, automatic target recognition, and precision accuracy with a warhead able to destroy a well-protected structure. The Tri-Service Standoff Attack Missile (TSSAM) was a joint service program with the Air Force as the lead service. The program objective was to develop a family of highly survivable, conventional, stealthy cruise missiles to satisfy tri-service requirements to effectively engage a variety of high value land and sea targets. The technical approach to develop a modular stealth cruise missile which can employ several payloads and guidance systems to engage the required targets. All variants used a GPS aided inertial navigation system. The Navy and Air Force (unitary variant) missiles used an imaging infrared terminal sensor for autonomous recognition and homing on fixed land targets and sea targets. The other Air Force variant contained the Combined Effects Bomblet (CEB) submunition to attack land targets. Integration efforts were planned for the Air Force�s B-52H, F-16C/D, B-1 and B-2 and the Navy�s F/A-18C/D. TSSAM was touted as the most silver of bullets because of its low observability capability. Northrop Aircraft Division's cost/schedule control system did not provide the Government with reliable data and the data was not promptly submitted; therefore, the Joint System Program Office could not effectively measure the contractor's performance or use the cost data to make informed management decisions. Management of TSSAM Program funds was fragmented among the three Military Departments, resulting in an awkward budgeting process, funding shortfalls, and delays in program and contracting decisions. The system had significant development problems, and estimates of the unit cost in production were unacceptably high. That made it a logical candidate for cancellation. After the TSSAM procurement unit cost increased from an estimated $728,000 in 1986 to $2,062,000 in 1994 (then-year dollars), the Department of Defense (DOD) terminated the program. On 09 December 1994 the Secretary of Defense announced cancellation of the TSSAM program. DEPSECDEF Program Decision Memorandum (PDM) IV, 16 Dec 94, canceled the TSSAM and associated contracts. Many TSSAM program specifics remain SECRET -Special Access Required per the 31 March 1993 Program Security Guide. Following a comprehensive reassessment of force requirements, the Air Force and Navy agreed they urgently needed an affordable missile with most of TSSAM's characteristics. They proposed a joint program that would build upon the lessons learned from TSSAM and more recent programs that use new acquisition approaches. On September 20, 1995, the Principal Deputy Under Secretary of Defense for Acquisition and Technology approved the initiation of the JASSM program, under Air Force leadership. The publicly released retouched photo of TSSAM revealed the vehicle's stealthy shape, but little of engine ports or sensors.